Each candle burns for approximately 8 hours. 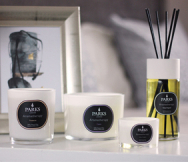 The Parks 3 Tot Mixed Fragrance Gift Set 1 contains 3 of our best-loved fragrances. The 3 Tot Mixed Fragrance Gift Set 1 comes in a presentation-quality gift box, so no further wrapping is required to make a delightful gift.